True North Sports + Entertainment announced today that it is updating its re-entry policy to a no re-entry policy at the MTS Centre during events and hockey games. Starting Sept. 1, 2017, patrons attending any event at the MTS Centre will no longer be allowed to re-enter the arena after exiting. Re-entry exceptions, such as emergencies, childcare or medical reasons, will be determined on a case-by-case basis by event staff and security. The no re-entry policy allows us to have more control of the air-temperature in the venue year round while providing greater security for our patrons. Based on ticket re-entry data collected by True North, the new no re-entry policy will have an impact on approximately 10% of the audience or 1500 patrons who attend Winnipeg Jets home games. Leading to Sept. 1, True North will also have a transition period over the spring and summer to educate patrons about the no-entry policy. True North currently has a no re-entry policy in place at the Burton Cummings Theatre, which has been active for the past 18 months. 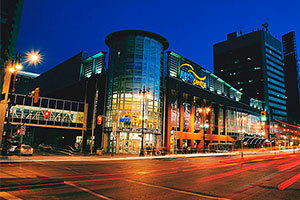 True North Sports + Entertainment owns and operates the MTS Centre, Winnipeg Jets (NHL), Manitoba Moose (AHL), MTS Iceplex, and Burton Cummings Theatre. Additionally, True North is currently developing True North Square, a mixed-use development that will be located adjacent to MTS Centre. Committed to community development, True North proudly supports the True North Youth Foundation, the charitable arm of True North and the Winnipeg Jets.